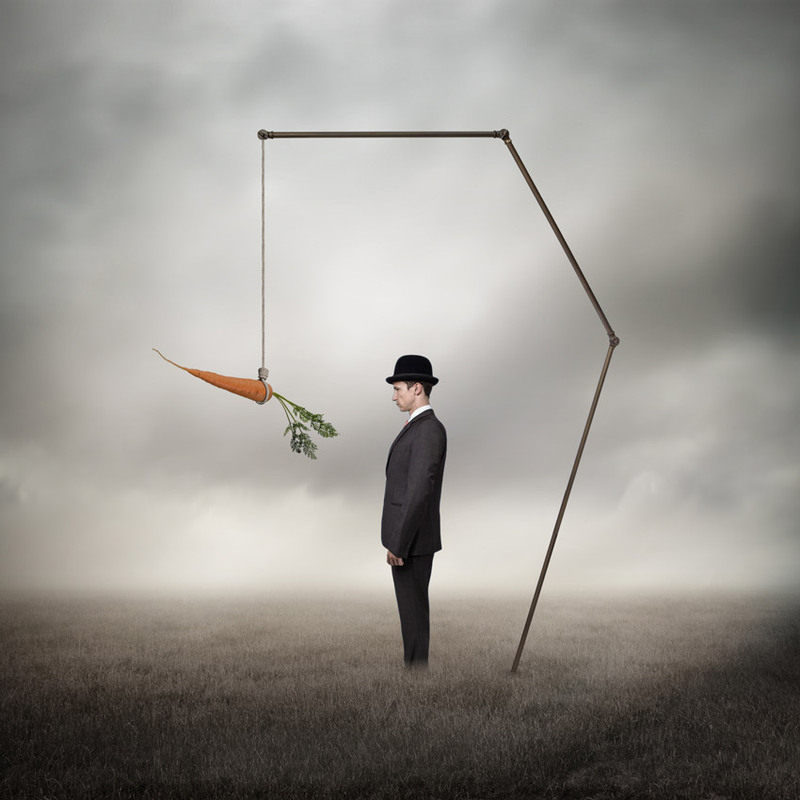 This surreal scene of a man in a suit, in a field of grass, with a giant carrot dangled in front of him, is sparsely colored with the carrot and man in color, on an otherwise gray landscape. The black and white color scheme and serene nature reflects the signature style of contemporary photographer Philip McKay. Philip McKay’s fusion of black and white photography with digital artistry evokes the existential exploration of being. Employing a variety of digital manipulation techniques, filters, lenses, and time exposures, the artist embraces light as a study in solitude, the vastness of space, and the transience of time. The resulting imagery expresses the uniquely surrealist vision of one of the world’s most famous digital artists today. A Liverpool native, McKay’s interest in photography was instilled in him at an early age, but it wasn’t until a few years ago that he made the transition to the realm of “digital surrealism”. In combining his technical methodology with a singular, dream-like aesthetic, Philip McKay both challenges and augments the concept of traditional photography as an artistic medium. His images do not merely capture moments in time, but create a surrealist reflection of the world and our space within. Philip McKay’s work has a place of pride among sterling contemporary collections throughout the United Kingdom. As a pillar of digital artistry, McKay has also designed a variety of books and album covers, and most recently worked in collaboration with famed film composer Michael Price (Lord of the Rings, Quantum of Solace). 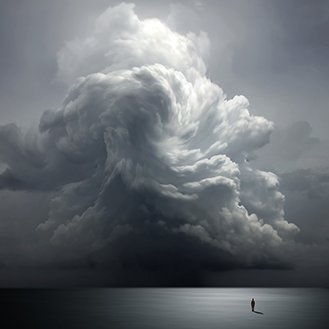 Mahlstedt Gallery is thrilled to represent Philip McKay, a surrealist visionary of modern digital composition. This surreal black and white landscape features a shimmering moonlit flatland crowned with mighty storm clouds rising high into a silver sky. The black and white color scheme and serene nature reflects the signature style of contemporary photographer Philip McKay. 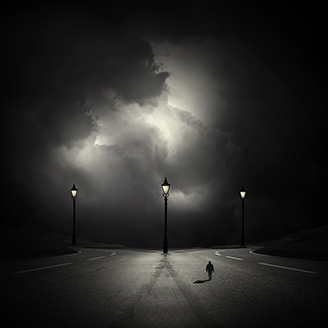 "All Roads Lead to" by photographer Philip McKay captures the surreal concept of making a life changing decision. This contemporary shot portrays roiling clouds casting an apprehensive light on a split in the paved road ahead of a figure walking in solitude. The black and white color scheme and serene nature reflects the signature style of contemporary photographer Philip McKay. "And is Gone" portrays a thoughtful woman standing in a boat, contemplating solitude as her red umbrella floats away on a draft of wind. 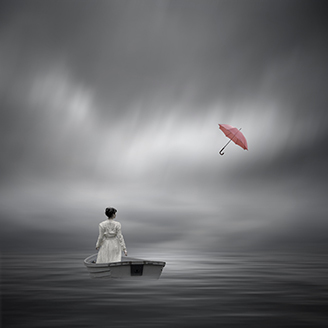 The silver tones and serene nature of this contemporary photograph speaks to the style and voice signature to the work of Philip McKay.